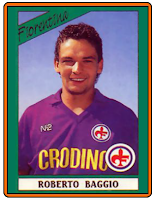 In 1989 Napoli Italian champions were playing Fiorentina at home. A young, thin, tiny looking player called Roberto Baggio with a shock of long curly black hair picked up the ball in his own half. He then seemed to move with it in a strange diagonal direction. As one defender came towards him, he shifted straight towards goal, and with a little skip over another defender's leg, breached the entire defence. Almu.i without needing to dribble, thanks to a remarkable sense of the space of the pitch, he was through on goal. There, as usual, he was cool enough to dribble past the goalie, get the ball caught up in his legs and still have time to slide it into an empty net. 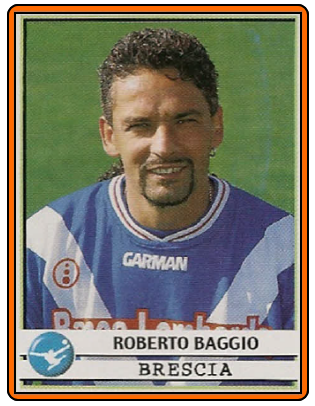 In his career, Baggio scored dozens of goals as good as this one, some of them just as good as Maradona's second goal against England in the 1986 World Cup. 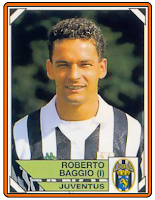 Baggio has also been the most prolific penalty taker in Italian football history, converting 86 per cent of his kicks. 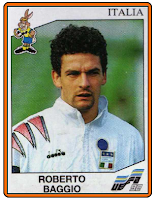 How odd, then, that he should be remembered above all for a penalty he missed, in the searing heat of the Pasadena stadium: the miss that decided the 1994 World Cup final. Like many great players, Roberto Baggio has an unprepossessing physique; you would not notice him in a crowd. Yet, that anonymous build masks an elegance of touch and movement rarely seen on a football field. When Baggio scored his two-hundredth league goal in 2004 - after a trademark dribble and perfect side-foot - TV stations showed many of his past efforts. 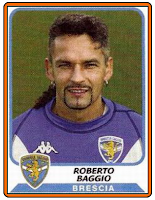 A very high percentage of his goals were items of sheer beauty chips, dribbles, free-kicks, volleys. In the 1990 World Cup he scored the goal of the tournament against Czechoslovakia after a run and delicate chip. 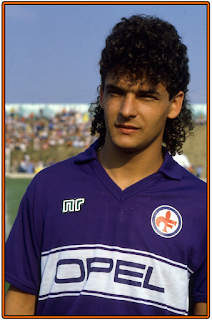 Moreover, Baggio scored all these goals from a position that was not that of a pure forward very few were tap-ins or headers and often for minor clubs - Brescia, Bologna, Fiorentina. 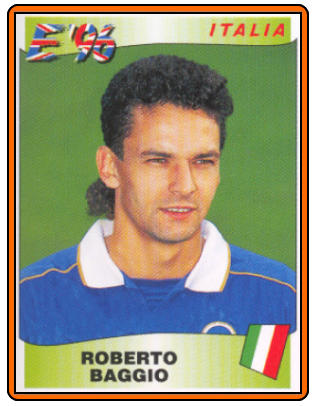 Roberto Baggio was born to a well-to-do family in the Veneto rural town of Caldogno in February 1967. 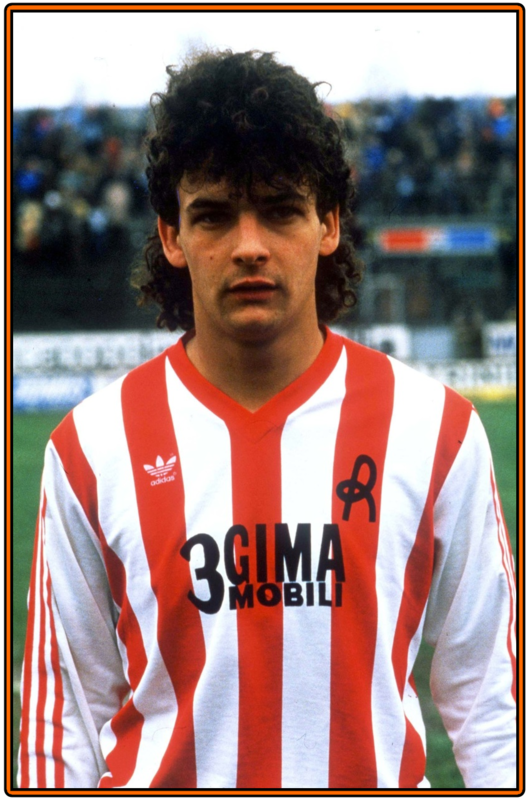 His first games were with Vicenza, the best local team, and it was there that he suffered the first of a series of terrible knee injuries that have plagued his career. Turning sharply (in May 1985) he twisted the cruciate ligaments in his right knee. Baggio did not play again properly for nearly two years, after re-injuring the same knee nine months later. 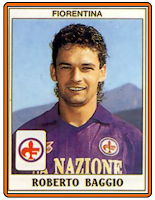 In the meantime he had been signed by Fiorentina. 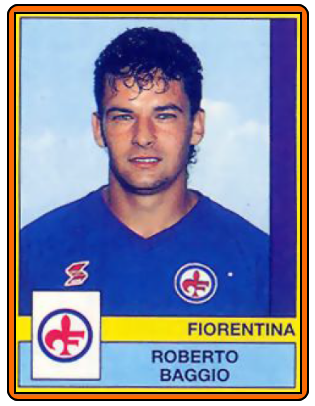 In Florence, he quickly became a hero, striking up a formidable partnership with striker Stefano Borgonovo.20 With Baggio, and Eriksson on the bench, Fiorentina qualified for Europe and got to the UEFA Cup final in 1990. 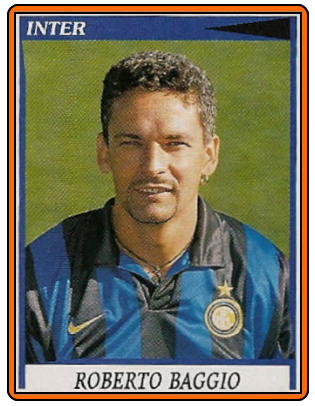 Baggio started to unveil his whole repertoire of goals for the viola fans - the perfect free-kicks, the tight dribbles, the ability to stay cool under pressure. 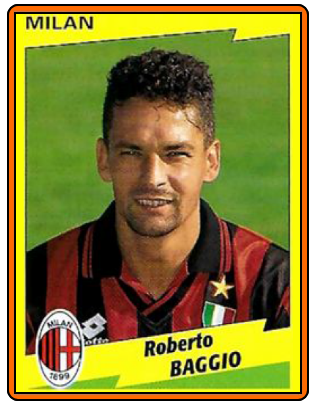 Against Milan, in the San Siro, he again took on the whole opposition defence, and scored. As a penalty-taker, Baggio often waited for the goalkeeper to move. 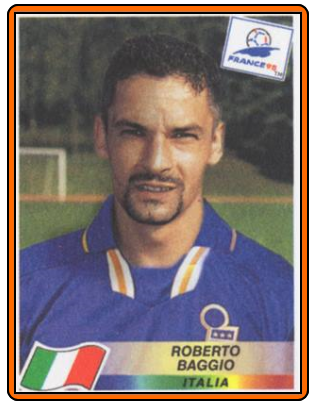 He missed very few, fewer in fact than any other player in the history of Serie A. 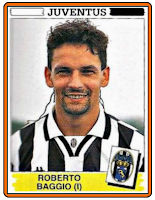 In 1990 news started to spread in the Renaissance town that Baggio had been signed by arch-rivals Juventus. Fiorentina had just lost the UEFA Cup final to Juvc after two violent games. Fans rioted, and the police were called, but it was too late. 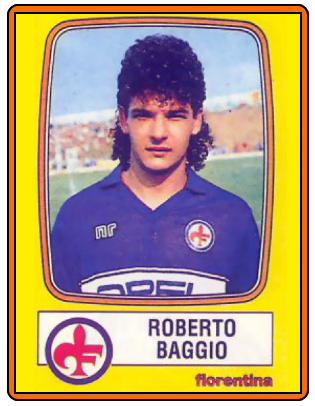 Baggio had gone, never to return. Baggio chose Juve at the wrong time. 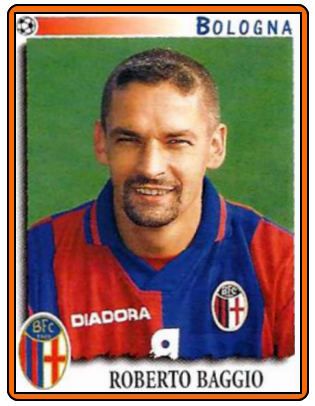 The team had just been re-founded under the 'modern' leadership of manager Gigi Maifredi, who had taken Bologna from Serie C to Serie A. Although 'the divine ponytail' scored regularly, the team did very badly, finishing a disastrous seventh. 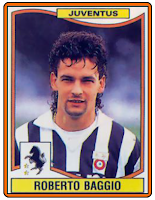 Nor did Baggio endear himself to the Juventus faithful by his loyalty to Fiorentina. In the Fiorentina-Juve match in April 1991, Juve won a penalty. 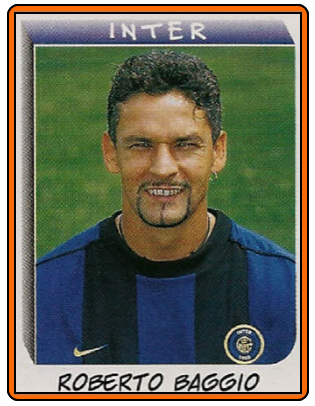 Baggio refused to take it, and it was missed. 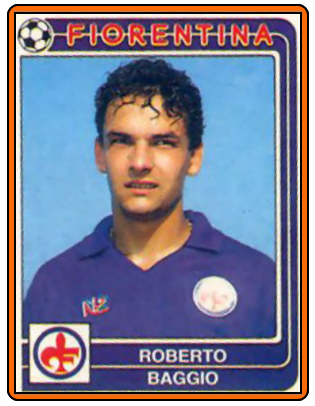 He was then substituted, and on his way to the bench picked up and put on a Fiorentina scarf. Weeks of argument followed. At the end of the season, Maifredi was sacked, and Juve returned to old favourite Trapattoni. 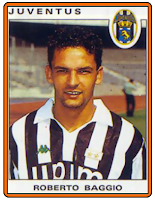 Baggio continued to score hatfuls of goals, winning the UEFA Cup in 1993 and being made European Footballer of the Year. 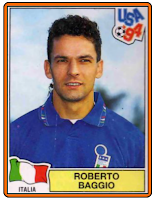 He became the key player for the national team, taking the team almost single-handedly to the 1994 final. But domestic honours eluded him. When Trapattoni was replaced by Marcello Lippi in 1995, Juve went on to win the championship, but the relationship between Baggio and his new manager disintegrated. 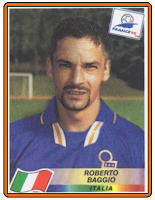 He played a mere seventeen games in that championship-winning season (with eight goals), and moved to Milan the following year. Baggio's fame led to frequent arguments with many of the managers he played under, and he always railed against tactical instructions. Milan's fans (as with all Baggio's teams, apart perhaps from the juventini) loved Baggio, but once again he was marginalized by a succession of managers. 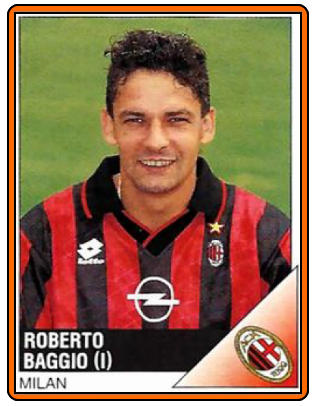 He only turned out 51 times in two years for Milan, winning another championship. Desperate to get back into the national team, Baggio decided to move to a smaller club, Bologna.His best season followed: 22 goals and a call-up for the 1998 World by popular demand . 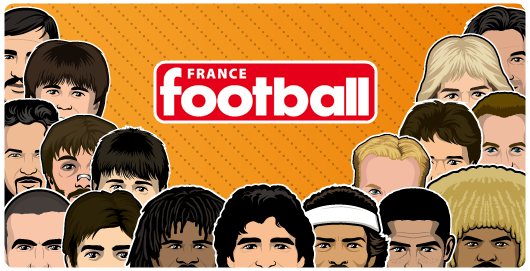 In France, manager Cesare Maldini absurdly left him out of the key matches, although he was a hair's breadth from knocking out the eventual champions and hosts with a golden goal attempt. Back in Milan, this time with Inter, the old problems with Lippi re-emerged. Left on the bench, his talent seemed to be going to waste. By the end of the season, his relationship with Lippi had deteriorated so much that the two hardly spoke. He left his mark in his final game for Inter, a playoff for a Champions League place, where he scored two classic goals to give Inter victory. 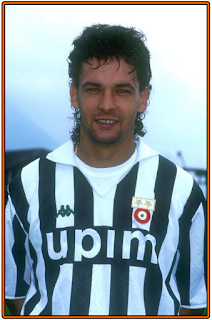 Baggio later criticized Lippi in the first of two highly successful autobiographies, writing that 'he is not my enemy. I simply have no respect for him, just as he has no respect for me.' For a time it seemed as if Lippi would even sue Baggio over this and other comments. 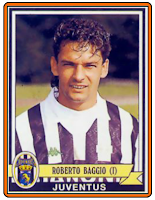 Once again, his career seemed over, but was revived by a small provincial club - Brescia. 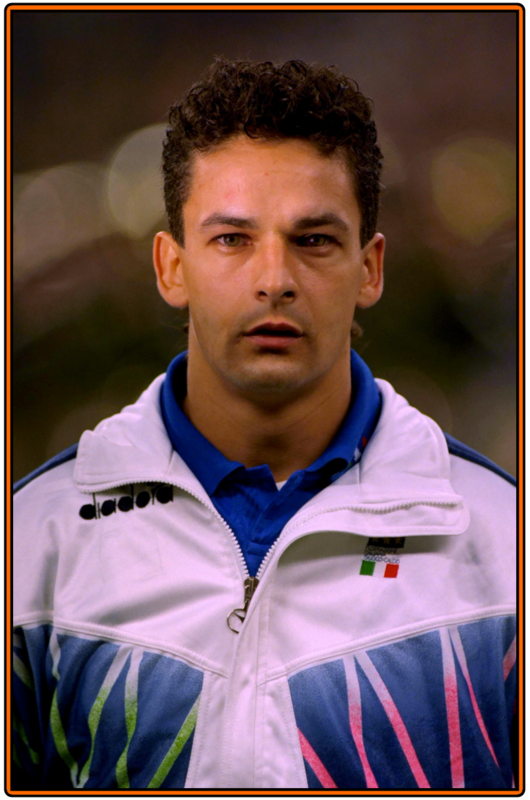 With Baggio in the team, Brescia reached the heights of seventh place and competed in Europe. 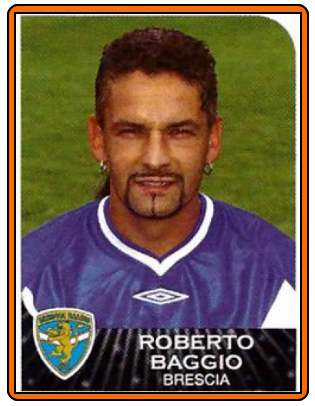 In 2002, yet another knee injury seemed to have put paid to Baggio's romantic hopes of one last World Cup with Italy. A miraculous recovery, just 76 days after the injury (and with two goals in his comeback match), put pressure on Trapattoni to pick him, but the miracle did not happen, despite special websites and phone lines dedicated to the campaign: Baggio in nazionale! 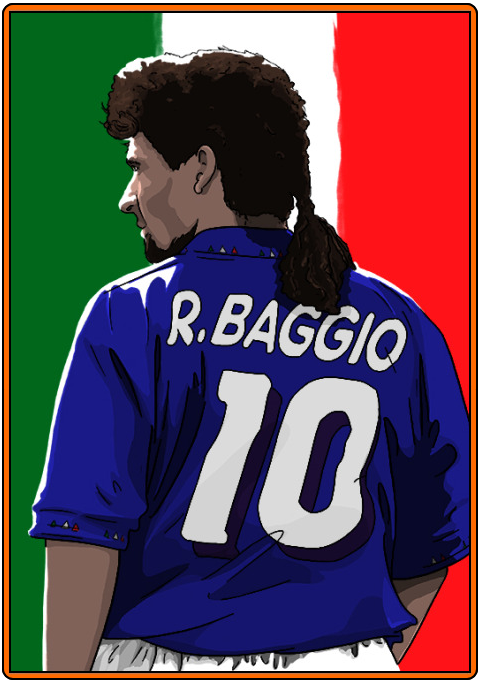 During the 2003-4 season, as he scored his two-hundredth league goal (and he had already reached 300 career goals), Baggio announced his retirement at the end of the season. As one of the very few players to transcend club loyalties, Baggio even has a club dedicated to him, which attracts fans from all kinds of teams. As a tribute to his popularity Trapattoni picked Baggio for one last friendly match for Italy, where a sell-out crowd applauded his every touch. Apart from his genius on the pitch, Baggio was different to so many of his fellow stars of the 1980s and 1990s. 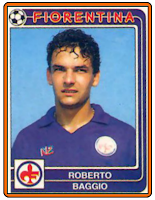 A shy, reflective family-man, he shunned the high living of stars like Vieri and Totti, with their model-and-media girlfriends and expensive night-club and yachting lifestyles. Baggio was a Buddhist in a Catholic country, and rarely displayed the histrionics so common at all levels of Serie A. He knew what he wanted, but he could also express emotions that seemed to have no place in the modern, cash-dominated game. When fellow Brescia player Vittorio Mero died in a car crash in January 2002, Baggio was instrumental in getting a game called off as a result (the players had heard of the accident just before kick-off). 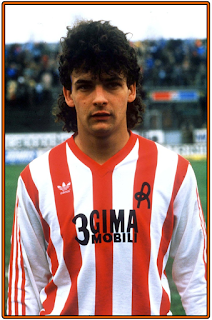 He later dedicated goals to Mero and continued to remind fans and players of the tragedy throughout the following season. 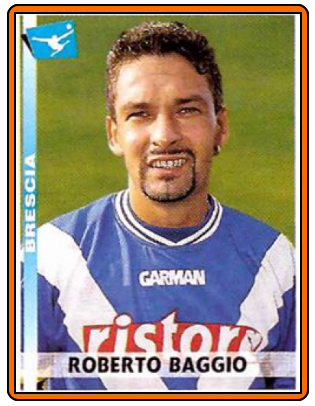 His decision to play out his final seasons with lowly Brescia allowed him the space and security that he had rarely had in the rest of his career, and he created yet another set of loyal, almost fanatical Baggio-followers. 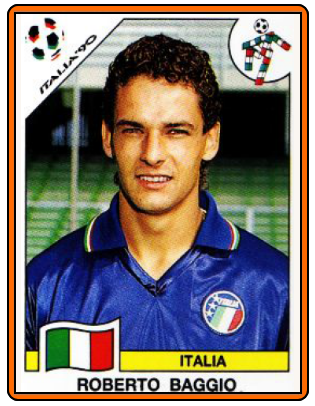 Despite his vast talent, Baggio played only 56 times for Italy, scoring 27 goals (the fourth best, behind Piola, Meazza and Riva). His international career was cruelly restricted by his outspokenness and his resistance to rigid tactics. Had he played 100 times, as he surely should have done, he would have easily beaten Riva's goalscoring record for the national team. ZIDANE’s best-ever performance for Les Bleus ?